Sammich » The Pub » The Bar » New Xmen Movie - Starring One Of Our Members!!!! But this isn't about Karasu. This is about CS23. Many of you know what he looks like, and in fairness, it's nothing special. To women, he's just another dude, but to Karasu, HE REALLY DOES LOOK LIKE WOLVERINE!!! FROM THE MOVIE!!! And now, presenting CS23 in his battle outfit. Tell me, he does look like Wolverine, right? least you could have done was straight lines. its like he grew his fingernails out. Well, I feel that's acceptance enough that you think he looks like Wolverine. If he didn't, the quality of the claws wouldn't be important. xD Majeh win! although, I agree with cs, I dont see the reference. Inari wrote: although, I agree with cs, I dont see the reference. 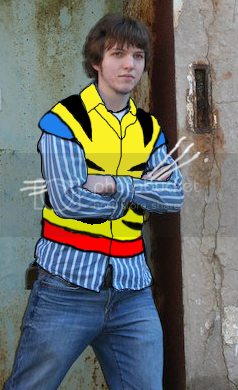 15 Re: New Xmen Movie - Starring One Of Our Members!!! !